New Orleans There’s no reason to get the big head. It’ll be a long four years. Or longer. Eventually, they’ll get this right or at least righter. 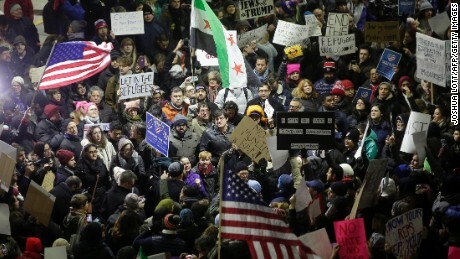 Nonetheless, there’s some evidence that we, the big WE, the collective we of all progressive Americans and maybe more, including those who are not progressive but at least aren’t haters, anti-immigrants, anti-women, anti-Muslim, are having some real impact, and that Trump is even semi-getting it, as well as others. An article, obviously fueled by leaks from the White House, to Wall Street Journal reporters Carol Lee and Peter Nicholas, quotes the President telling his top aides last weekend, while protests were blossoming like wild flowers at airports all over the country, that, “This has to go better.” Supposedly he tried to straighten out his chaotic staff structure where chaos has prevailed for most of the last two weeks. The always wacky, wild-eyed editorial writers for the Journal were even quoted in a story in their competitor, The New York Times, calling the travel ban rollout “incompetent,” though that seems a kindness. Karl Rove, George W. Bush’s Rasputin, writing in the op-ed page of the Journal spared no words in his criticism and included a grade-school level primer in his column on how quasi-normal governments would have gotten away with such an order. The handling of the order allowed the organized left to show its might, igniting big demonstrations throughout major cities. And not only downtown – they had to make it out to the airport to give the media the pictures, and they did. In Washington I witnessed a demonstration of many thousands of people carrying individualized, hand-letter signs. If all this was spontaneous, the left is strong indeed. If was a matter of superior organization, that’s impressive too. The handling of the order further legitimized the desire of many congressional Republicans to distance themselves from the president, something they feel they’ll eventually have to do anyway because they know how to evaluate political horse flesh, and when they look at them they see Chief Crazy Horse. Sorry about Noonan’s Crazy Horse reference, she went cheap there, but she’s going deep the rest of the way. There is no Facebook fawning here. No Twitter triumphalism. She’s a veteran, and she knows effective political organization when she sees it, and says so. Can we be our own “tea party?” That might be something to be proud of right now, but we have to be careful. Our strength is showing, but it can’t dissolve into arrogance and can be frittered away without tactical and strategic care. We also have the Times poking us about “black” teams and anarchist growth that no one controls, but they will try to make us own. A Times columnist even tried to lecture all of its readers, and all of us, about the proper way to target and conduct a boycott, while whitewashing Uber. Both of good reminders of how quickly the worm will turn. We’re not winning, but we’re holding our own. At least for now. We live and work in interesting times, and we’re adding our spice to the stew. Nothing but good can come of this. This entry was posted in Citizen Wealth, Community Organizing, Financial Justice, immigration reform, Organizing and tagged ariport protests, progressives by Wade. Bookmark the permalink.